Its been 'one of those' weeks but I'm all packed and ready to head off Monday morning for Fall In. 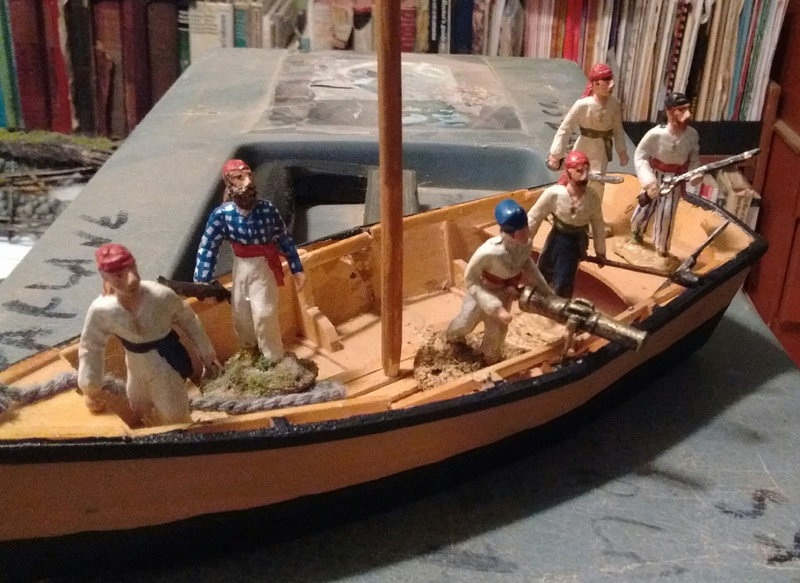 Some old homemade pirates (aka Brethren of the Coast), an old, cut down, tourist souvenir dory and a swivel gun made from a cut down Prince August 6 pounder. The plan was for two guns but at least the stubby one I manged to get done at the last moment can be shifted from side to side as needed. It seems odd to be going off with one plastic tool chest with some buildings and fences, a boat and crew, some QRS, and a company of not really needed Highlanders but Rob is providing the ground cloth, river, woods and armies so that's it. It also feels a bit strange to be going away period, its been over four years since I last had the freedom to be away for more than a long weekend. A small load like this with no figures would have been ideal if I were flying but that's waaaay too much hassle these days. Depending on the route, its somewhere between three and four hours actually in the air, adding the two flights together, but often roughly twelve hours from home to destination. Instead, since my new-ish car is in waiting for a new transmission, (surprise!) I have a cushy rental car provided by my dealer. Wasn't expecting that but they weren't willing to say it was safe to drive roughly 4,000 km in its current state of suspense. (I'm glad I'm a bit less timid and accepting about such things than my younger self was.) As a bonus, I managed to talk a friend into coming along for the ride this year (60 seconds well spent). We will be visiting both friends and family along the way and of course, at the destination there will be friends, games and trade stands. Next post probably a short one late Friday after the day's games. But as ready as they are going to get. 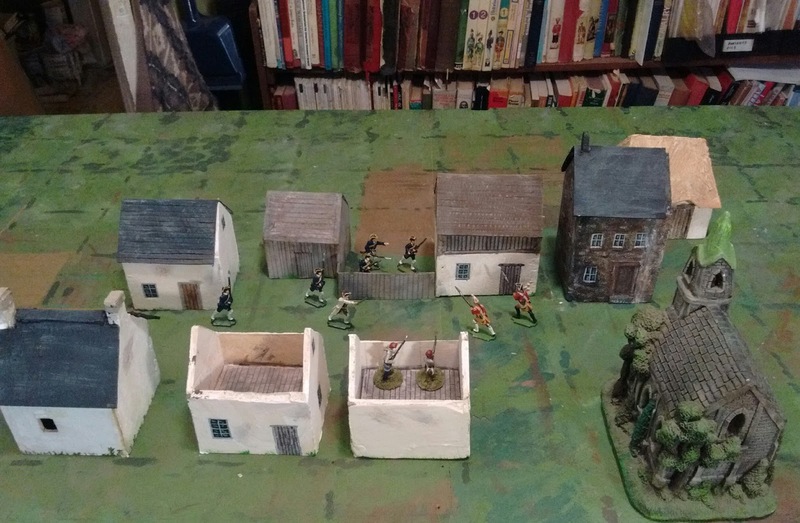 Actually, I think the naive appearance of the buildings fits rather well as an accompaniment to the shiny toy soldier finish on the semi-flat home cast figures. Of course rather than being naive by intent, what they really reflect is what a klutz I am and always have been at precision work whether real or toy, how tedious I find terrain construction and how little discipline I have. I did try to cut, fold and draw straight and make all the pieces traced from the same template end up being the same size and shape (don't ask), did intend to include more details like chimney's and shutters etc and the latter at least could be retrofitted but experience tells me that these will serve me happily as is for a decade or more. I did a quick check and at the rough scale of the game, my old farmhouse would occupy about one square inch. These are a bit more than three by a bit less than four or about the area covered by my house, woodshed, garden shed, garden, lawn, and the old hay barn on the far side of the little stream. My neighbours would be about eight to twelve inches away but in New France they would have been much closer though not quite cheek by jowl. I'm not sure how many houses were in the particular village that was involved in the skirmish that inspired my scenario but on a full sized 6x10 table for a small village on the river front and another in the second "rank" along a road parallel to the river, I could probably have found room for more than a dozen houses, barns and so on but these nine buildings will be just about right for my scenario, setting the scene and providing objectives without overwhelming the game. If I can harden my resolve, I'll make more of the board fences which along with the clay covered houses help reinforce that "this ain't the Pennsylvania frontier". I'd forgotten that there were a number of these fences in Louisburg which just goes to show that its been too long since I was last there. I'm not actually sure that I've been back since the Grand Encampment in 1999. I may need to plan an outing next year, after all, once the rest of the Prince August SYW French and British molds arrive, I expect to be staging a series of fictional campaigns around opposing British and French forts in a more populous Acadia/New Scotland. Twelve sleeps till I leave for Fall In. Six houses to finish plus six more to refurbish, a gun boat to equip (and hopefully crew), and some board fences to build. No problem. 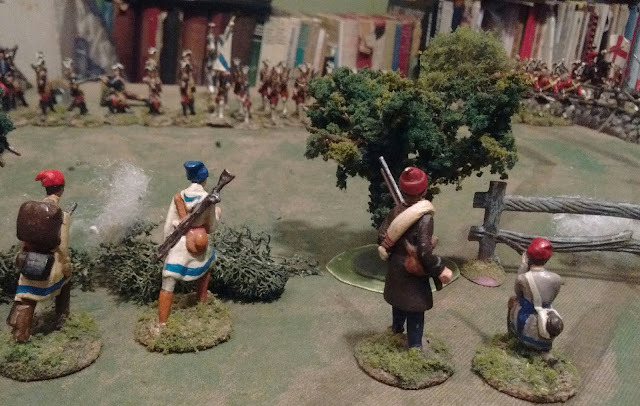 At least Rob already has all of the figures we'll be using including my Fraser Highlanders. 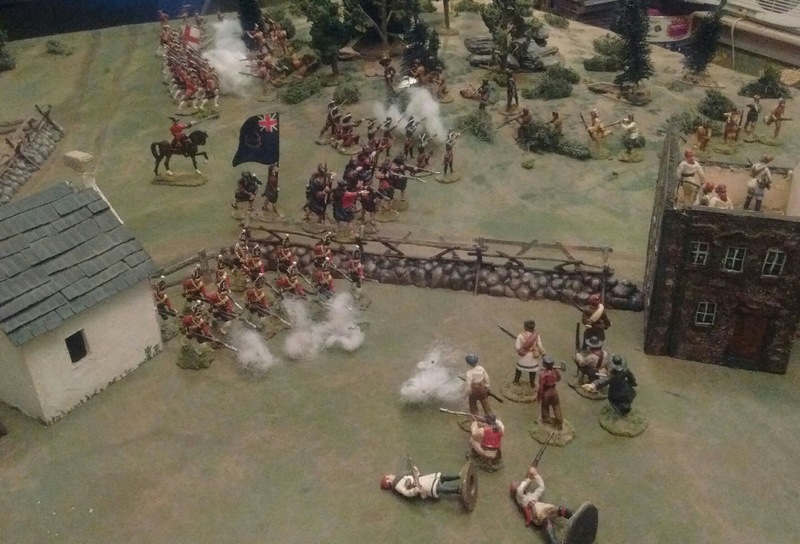 The British begin their first assault over the open fields against the French line. The houses are being made from foam core and cardboard in the mode of the Stone House often seen on my table but using the smaller foot print of the revised version which I have adopted with an eye to my smaller table and 4" grid. The basic technique is a slacker's version of the Major General's technique. I've had the idea and materials since I built the Stone House but have been stymied by not knowing just how I wanted them to look and what size to make them. It was the 1st track on this album by Les Séguins which I just about wore out at college. To summarise the relevant part: "my house has no roof, nor door, of windows, none, I enter from above...". Earlier this year I resolved the size issue and the decision to run this rural Quebec 1759 game decided the look for me. 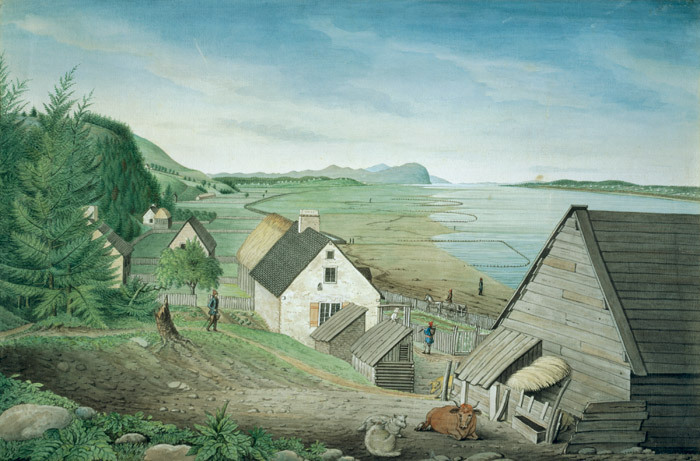 I'm reasonably familiar with the look of 19th Century Quebec urban houses from observation and from looking at prints of the 1837 rebellions but rural Quebec in 1759 is less familiar. Enter the internet which was quite helpful, especially this page on architecture in New France. As with many things there was no universal pattern and houses built in the late 1600's and early 1700's would have been more primitive and European peasant like just like later ones would be more likely to be stone even in rural areas. The basic structure would made with vertical posts and either horizontal or vertical wooden boards or a mix of wood and stone fill but usually covered by some form of plaster to keep the wind and snow out. Any one who has experienced winter in Quebec or New England will appreciate the need to block the cold north wind in winter from blowing snow and cold through any chinks in the wall. Windows would be few for the same reason unlike later homes when glass was more readily available. Thatch could still be found but wooden boards or slate were more common on houses especially given the danger of fire from sparks in winter. One could add gables etc but I'm going for simplified, quick, rugged, underscale buildings with a "floor" to place troops on when the roof is lifted. The second floor is too far down inside most of the houses but my criteria was simply to make sure I could place a company of firing figures into the house and have their muskets stick over the wall to make more room inside. The following picture was especially useful. It shows the typical linear arrangement but also some interesting board fencing around the nearer fields where I have planned on making more snake rail fencing. It also shows that the houses themselves would be nearly useless for defence by all but a handful of individuals since there are so few windows to shoot from. 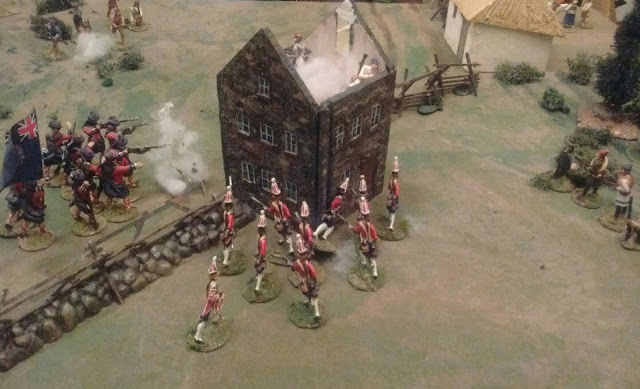 I am proposing that a string of my houses will represent an area of houses, barns, sheds and fences where skirmishers could take cover but not line infantry . A large, stone, seigneurial manor or similar might be a more formidable strong point such as the windmill at Ste. Foye. Inevitably these houses will end up being used in imaginary lands and I hope to do more stone city buildings. The idea I had floated for Atlantica of making town buildings 1/2 square wide hasn't worked well in prototype and I have decided to compromise with the alternate plan of city streets being 1 square wide with buildings on either side. A standard town would then be a nine to fifteen square block needing four to six buildings for a full road junction, three to five for a Tee junction and anywhere from two to six for a town along a road without a major junction. Grandiose plans might call for several such for a major city fight but most tables will only have one. It was nip and tuck but after a fallback and rally, a second attack won the day allowing the British to torch the supply depot. Of course these are for wargames so I must keep in mind that all too often at least some of them will end the game going up in smoke. I managed a last (I think) playtest of 1/2 of one of the scenarios today. Two weeks till we head out. 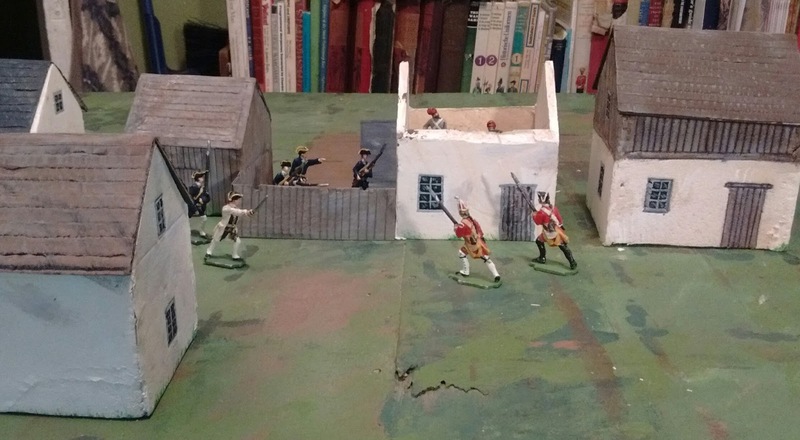 Quebec militia skirmishers open fire at extreme range. More pics perhaps tomorrow but if I don't start working on more fences and buildings VERY soon, I shall have to speak VERY sternly to myself! A big thank-you to Nick from California. 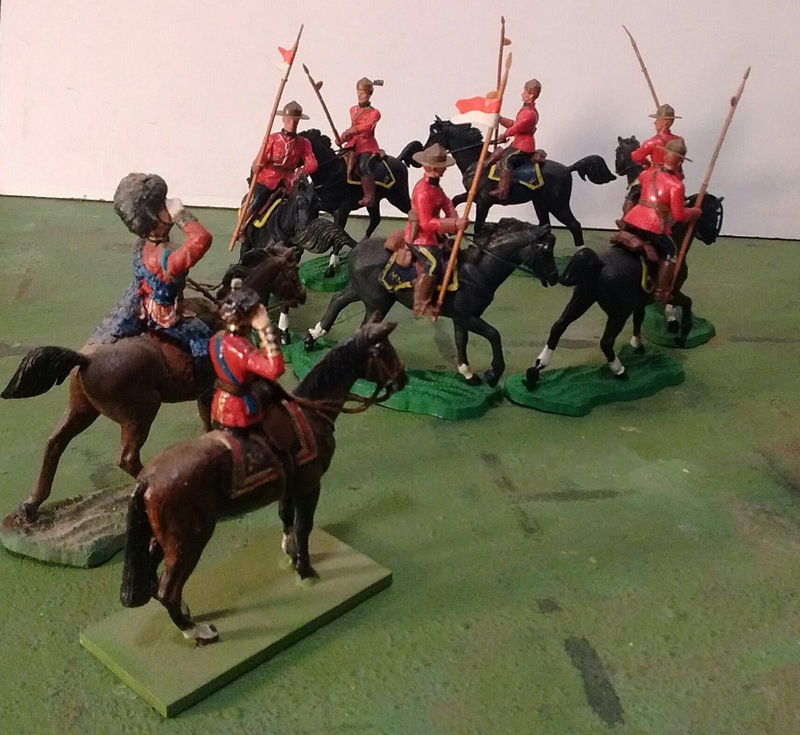 Having a 1/2 dozen old Britain's 54mm plastic 'Eyes Right' RCMP on hand and surplus, and having enjoyed the beginning of my 54mm NorthWest Campaign wargame setting, Nick did what only the best of on line wargaming comrades would do and offered to send them to me. 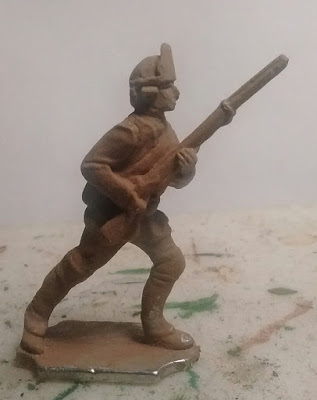 Oddly enough I had been eyeing the one Mountie I had as a kid, long since retired (and converted (damn you and thank you Henry Harris) and now serving as a retired, honorary Militia Colonel in the 5th Royal Scots and wondering what to use as a basis for a unit of NWMP. Question answered! Now, yes, in the 1870's the uniform was different and its unlikely the lance would ever have been carried on the plains but that sort of thing is just what this campaign is about. Print the legend and play with the toys the way they are. Luckily, there are a few damaged figures so I should be able to field a troop of three lancers in stetson and a troop of three mounted riflemen in pillbox caps. Excellent! It will have to wait untill after Fall In though. Late last night I received the sad news that the well known wargames blogger (amongst many, many, other things) Jeff Hudelson of Saxe-Bearstein finally lost his heroic fight with cancer earlier this month. 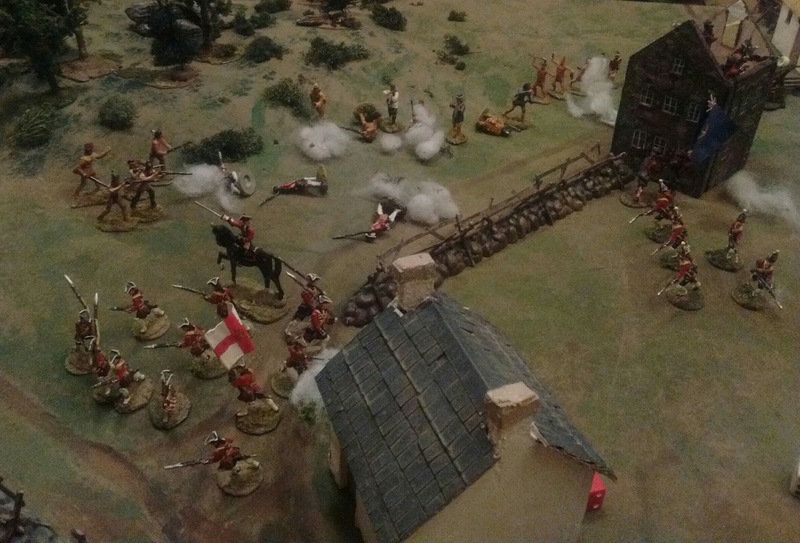 A shot of the battle of Wollmitz lifted from Jeff's blog. My friend and ally Tom trying to negotiate a town on our left flank. Jeff and I lived on opposite coasts of Canada, over 6,000 km apart, so I have only once had the pleasure of facing him across the table. 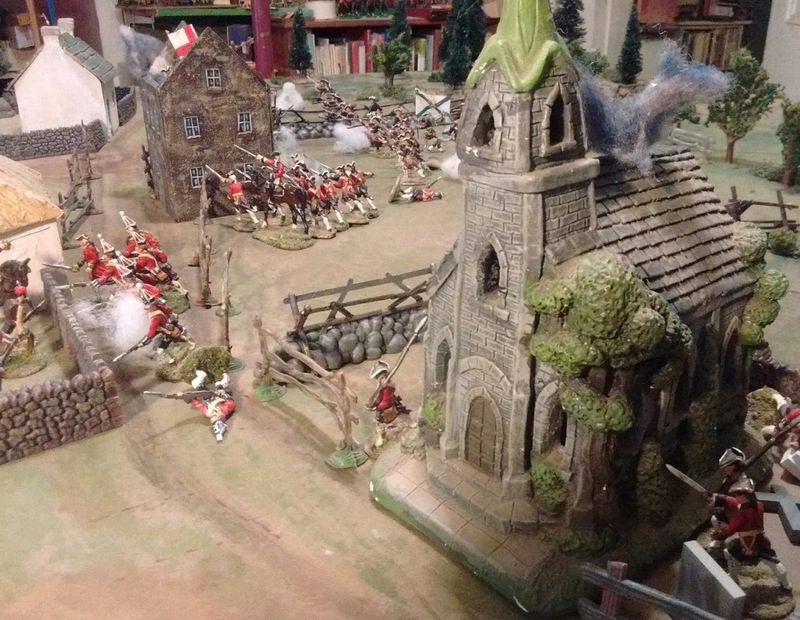 The occasion was the Battle of Wollmitz in 2008, back when I was maintaining a website rather than blogging. There was also a rather disastrous (for me) but fun Renaissance PBEM mini-campaign that he invited me to play in a few years ago ( alpianduchy.blogspot). Above all though, he was a valued friend, e-correspondent and fellow blogger whose emails, questions and observations often got my brain whirring. Orders had arrived at Fort Sackville for Colonel Fitzwilliam to march to Fort Edward with all haste. The infamous French partizan and agitator L'Abbe Le Corbeau had been seen visiting Acadian settlements along the Pisiquid river accompanied by the famed Mi'kmaq war chief La Moufette (easily recognized by his black and white war paint). As the column approached St. Croix, Fitzwilliam welcomed the sight of the first Acadian farms. He had cut his military teeth in the service of King Michael of Rosmark and had thought he would never see a wilder place than the Eastern Frontier of that land. When King George hired his regiment from King Michael and offered amnesty for the men whose father's had fought for James, Fitzwilliam thought he would be serving in Flanders but here they were in the wilds of New Scotland. So far the march has been quiet but one never knows who is lurking in the forest. He had brought a company of Rossish Chasseurs with him and they led the advance. His Grenadiers and a company of Highlanders formed his advance guard while two companies of his Irish Regiment formed the main body. Should be enough to handle any number of savages and French peasants but it was a long two day march along the military road through the dreary wilderness between Sackville and Edward. As the advance neared the first farm, blood curdling yells came from the woods to his left, soon accompanied by the Pop Pop and smoke of musket fire. Indians! He ordered the Irish into line facing the enemy and spurred ahead. The Irish deploy rapidly and prepare to blast the enemy back to where they came from. It was all going so well at first. The initial fire from the Indians seemed to be doing little harm but the return fire was cutting the woods apart and suddenly there was no one there. By the village the light infantry and grenadiers had uncovered some militia but they seemed like little threat and the road ahead was open. Fitzwilliam ordered the Highlanders up the road supported by the light infantry and grenadiers and ordered the Irish to take ground to their right while watching the woods. All was in hand. There seems to be an enemy hidden behind every tree and rock! Suddenly things were no longer going so well. 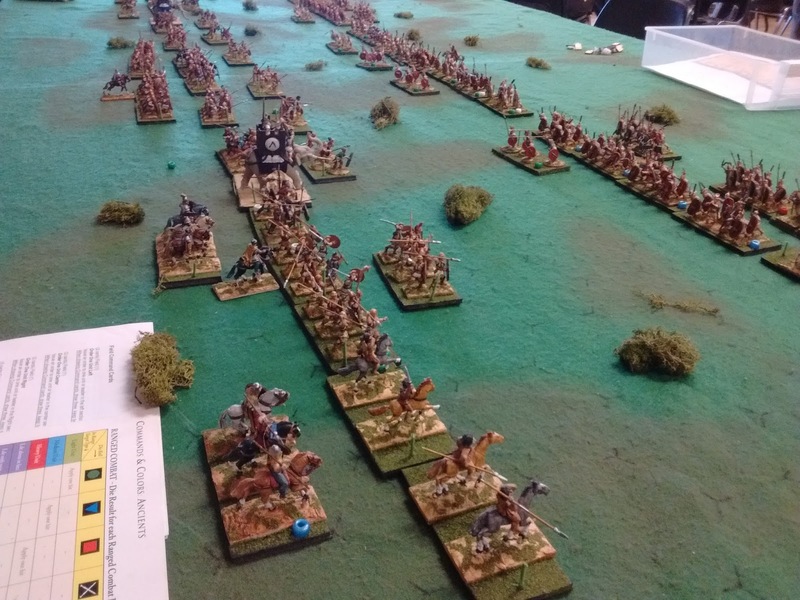 The Irish had no sooner started moving when the Mi'kmac reappeared almost on the flank and soon the gaps in the Irish line showed just how effective their fire had been so far. It didn't help that every wounded soldier seemed to be escorted by two friends. Ahead, a group of Canadian colonial troops and courer des bois was more than holding their own against the light infantry and new bands of Indians were emerging from the woods ahead of the column, or was it the same ones? Suddenly, the Grenadiers ceased fire, gave a cheer and threw themselves against a stone house that had been pouring fire into them. 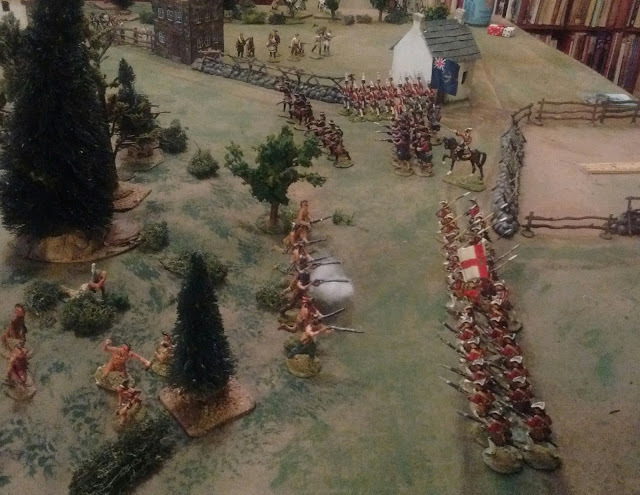 After a long struggle they came tumbling back and reformed but, there weren't nearly as many as before and the Abbe had led a party of militia up close to their flank to pour in a deadly close range fire. The impulsive but futile charge of the Grenadiers. That stone house was a pain in the ...neck. 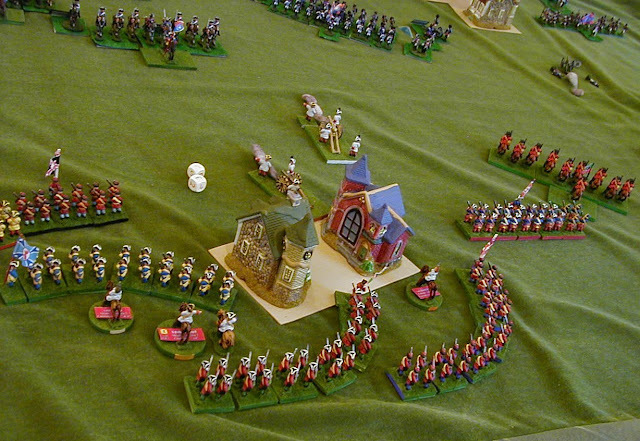 Fitzwilliam ordered the Highlanders in and minutes later they had it. 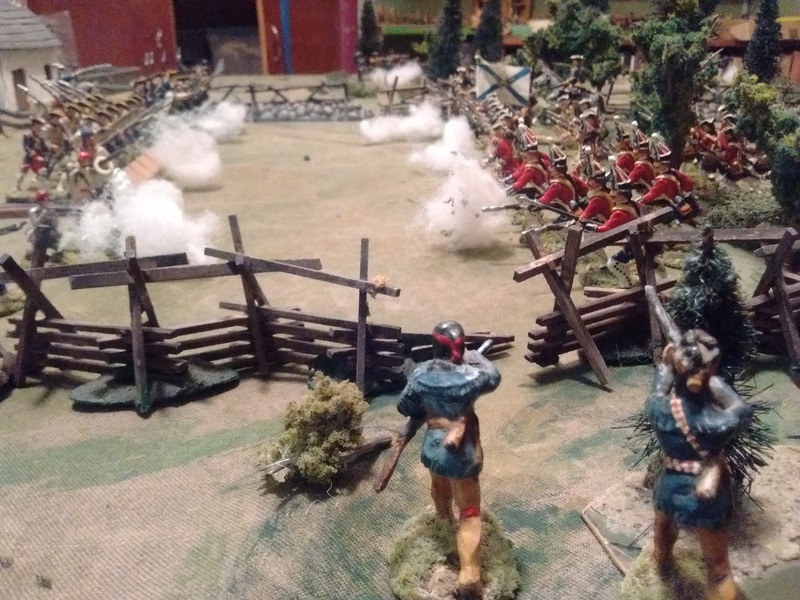 Behind them though the Chasseurs had had enough and the last handful scampered back down the road allowing bands of Indians to creep up close enough to do serious harm to the Irish while weakening the Scots enough that they didn't dare leave cover. The Grenadiers tried to drive off the last unit of militia but these fled back to the woods then resumed a long range fire. Eventually the Grenadiers could take no more and fell back with the handful of remaining militia content to let them go. Suddenly La Moufette appeared behind the Irish with a small band of Mi'qmac. A surprisingly accurate long range fire combined with the fire from in front was more than the Irish could take. The ranks faltered then broke. 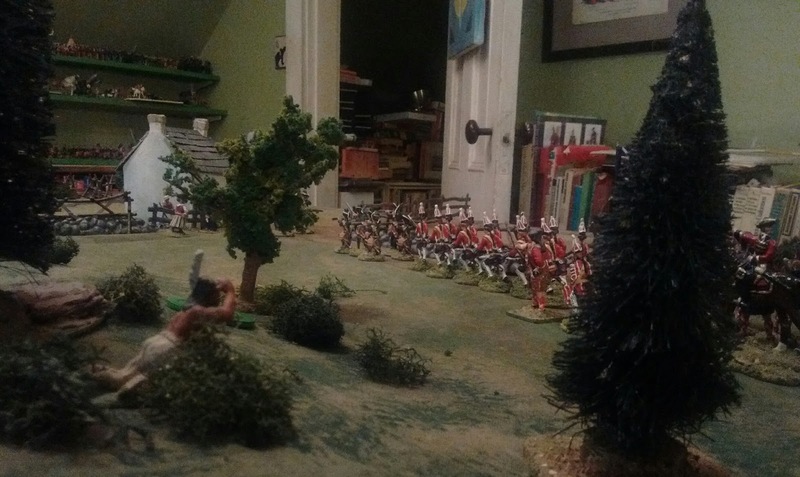 Luckily the enemy had been mauled so badly that they let the Highlanders cover the retreat without even attempting to follow up. To me! Rally to me! Men! Men? Oh damn! British: 1 commander, 1x12 Grenadiers, 1x8 elite Highlanders capable of acting as light infantry, 8 light infantry, 1 battalion with colour party and 2x12 infantry. Ttl 55 figures. 5 units, 4 units broken. French: 1 commander, 1 subordinate commander, 1x8 veteran irregular light infantry, 5x8 irregular light infantry. Ttl: 50 figures. 6 units. 2 broken, 2 more 1 hit from breaking. Only just started to rain slightly a few minutes ago but I managed to coax MacDuff on to the table anyway. The fall is often like this, a short window of ideal weather in which there are 1001 outside things to be done before the cold and the snow set in and so less time tban usual for hobby stuff. This year is just more so thanks to various additional little domestic distractions including a 3 month drought. You don't realize just how convenient hot and cold running water is until you do without for a month or so. Prototype SYW in America Ranger from Prince August Russian Grenadier. 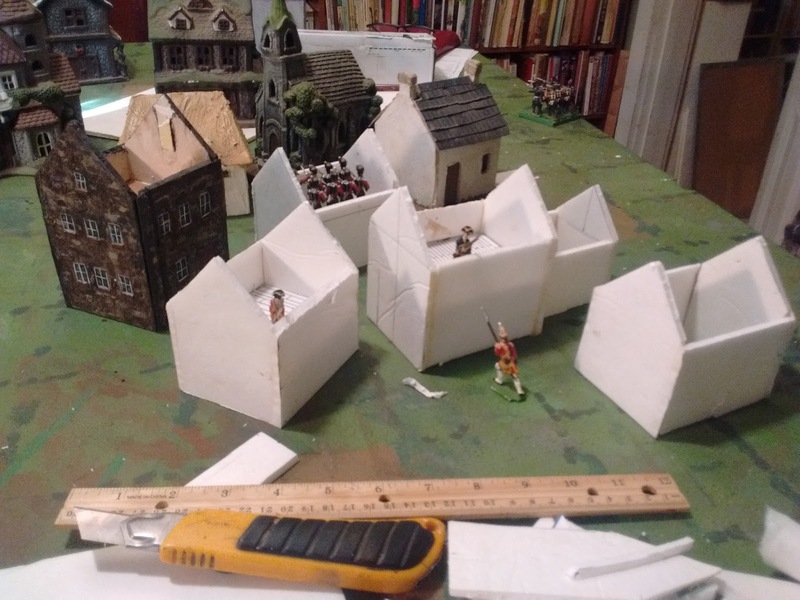 I'm fast running out of time to make the buildings and fences I want for Fall In, not to mention play testing and all the other prep work but at least I've finally, reluctantly, by trial and error, decided on a design for Quebec houses, still undersized for a semi-skirmish game like MacDuff but bigger than I want for home use on the grid. Bother. Of course what I would rather be doing is converting and painting some figures, like the prototype ranger above, but since I don't need them for Fall In, that'll have to wait until I get my share of the convention games ready! They turned around the hurricaine that I was hoping would bring us 6" of rain but are dangling before us a forecast of rain for Sunday. In the unlikely event that that happens, the outside chores can wait and I'll put a MacDuff 1759 game on the table. This evening I made it to an all sorts of games day in Kentville where Jeff (armchair commander blog) was hosting another epic (ie multiplayer) C&C ancients game. I hate to admit it but that was a satisfying way to end a game! 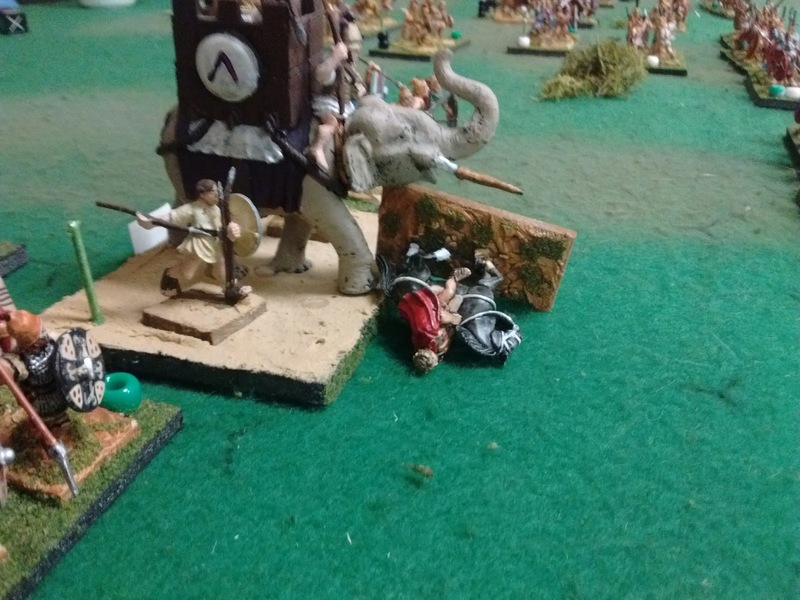 I took the Carthaginian right wing in a Punic Wars battle in Spain. Little bit of cavalry and light infantry skirmishing, a bit of trash talk and then, when eventually threatened by a serious attack, a dashing counter attack with Ellie as the star. After a little softening up by various light troops she went in and stomped a darned good roll wiping out some Hastati and then rolling a Helmet to add the General and coincidentally bring the Roman forces to defeat. The bulk of the fighting and dying was done in the centre and left but I am pleased to note a 5:2 kill ratio on my flank as my share in a hard fought, close, battle.